Provide comfort for the family of Steve Melnychuk with a meaningful gesture of sympathy. Steve was born on a very cold day in Cowan, MB, and left this earth on an equally cold day on February 4, 2019 at the age of 95 years. He was tough as a prairie winter storm, which helped shape the man he became. By eight years old his father had passed away and with his brother, Paul, he would haul and chop cord wood, milk cows and generally work as men of the household. By fifteen his mother also died and he was forced to venture out to work for his survival. He threshed, stooked, drove horses and hauled wood over many parts of Manitoba in those tough years. He was forced to beg for food and ride the rails to make his way and yet he never gave up. Steve joined the war effort but with one very bad eye he took up airframe mechanic work. He trained across Canada and was deployed to Britain to work on various planes. 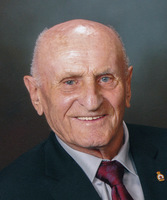 Upon returning to Canada he was retrained to become an auto body mechanic and set out to reconnect with his brother Paul in Edmonton. He met and married Mary Krawchuk and they had two girls. He built a house next door to Mary’s family and they lived on 48 Street in Beverly for 40 years. Over those years he worked in many auto body shops and tried his hand at owning a truck. Steve eventually took a position of maintenance man for Southpark Motors and then finally landed his dream job, program aide at M. E. LaZerte High School. Those were his golden years as he got to use the skills he had developed in many fields to support teachers and students in the industrial arts classes at the school. Steve retired at 63 but kept building houses and working with wood and metal. He continued to volunteer at EYOC and M. E. LaZerte as he felt so happy working with young people; in essence becoming the teacher he always wanted to be before he had to quit school after grade 8. He also continued playing golf until 85 and swimming until 91. He loved Jeopardy, good political books, sharing his life story and he had a joke for every occasion. He celebrated life, even with its ups and downs. Steve is survived by his loving sister, Rose Hines of Nova Scotia; daughters, Janice (Edd Vass) Melnychuk and Judi Tilley; grandchildren, Angela (Patrick) Ball, Solly (Lawrence) Webb and Steven Vass; great-grandchildren, Liam and Levi Webb. He is also survived by many nieces and nephews on both sides of the family and friends. Predeceased by his wife, Mary (nee Krawchuk); parents, Dmitro and Helene Melnychuk; sister, Victoria Derhak; and brothers, Paul and Bill Melnychuk. The family would like to thank the staff from the Greater Edmonton Foundation Beverly and the Kipnes Centre for their help, support and friendship in Steve’s later years. To honour Steve’s memory, there will be a Celebration of Life on March 9, 2019 at 2:30 p.m. in the family room of the ACT Centre, 2909 – 113 Avenue (Rundle Park), Edmonton. Please join us for stories of a hard working man, a true survivor, a much loved brother, father, Gido and uncle.